BMW's classic 3 series E92 / E90 models are extremely popular cars and we get loads of enquiries for this car. To help our customers we have decided to build a page on our website listing the range of products and services that we offer for this model. For an expensive car, the audio system is very disappointing. The display and integration is excellent but the sound quality, and bass from the original speakers / woofers is very poor. Even the factory upgraded sound system on some models leaves alot to be desired. 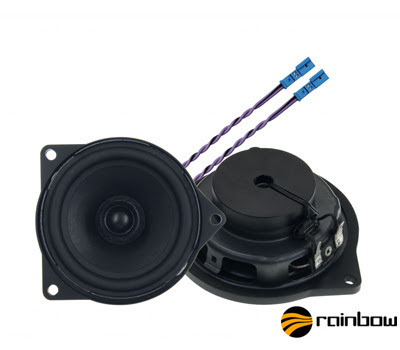 We offer fantastic car audio upgrades for the BMW 3 series E92 / E90 from German company Rainbow. This series of vehicle-specific speaker systems is as compact as it is powerful. The supplied accessories are designed to offer the easiest installation solution even in the tightest factory speaker positions. The tweeter and seperate crossover network included in this set give far superior sound quality and detail compared to the original speakers. Front tweeters, Mids, Crossovers and underseat Woofers. This series of vehicle-specific speaker systems is as compact as it is powerful. The supplied accessories are designed to offer the easiest installation solution even in the tightest factory speaker positions. We LOVE this complete front speaker package from Rainbow. The excellent combination of Tweeters, Mids, Crossovers and a pair of underseat subwoofers massively improves the sound in the front of an F10 / F11. Simply add a set of rear door speakers from option 1 or 2 above for a complete system or for the very best sound add a Rainbow or Hetrz amp to run the full system. This series of vehicle-specific speaker systems is as compact as it is powerful. The supplied accessories are designed to offer the easiest installation solution even in the tightest factory speaker positions.This pair of subwoofers is to replace the factory 8" subwoofers under the front seats and provides more bass to the system. Compact 4-channel, ideal for creating the perfect Audio Joy system. Compact in size but a giant performer offering 100 Watts per channel into 4 Ohms or 150 watts into 2 Ohms. Bridge two channels to run a sub and you have a classic amp for a classic in car hi-fi set up. This is an ideal amp to work with 4 speakers OR to run the FRONT 3 WAY PACKAGE. assembled with high-quality components and feature a complete and by-passable crossover system. the subwoofer volume can be remote controlled with extreme preciseness. Lo-Pass A Ch: 50 ÷ 500 Hz(Hi) @ 12 dB/Oct. C Ch: 50 ÷ 500 Hz @ 24 dB/Oct. Band-Pass B Ch: 50 ÷ 500 Hz @ 12 dB/Oct. We offer several exhaust upgrades for the BMW E93 / E90. We offer both performance enhancing and cosmetic only upgrades. There are two main types of rear bumpers , the M-sport style and the SE style , depending on which model your car is there are different options. We offer a replacement rear bumper insert (diffuser) which has a hole for an exhaust tip on either side of the car , this allows for us to fit a 335i style exhaust rear section into the Msport rear bumper. The rear bumper insert comes in a matt or satin black finish , made from plastic and is very high quality. The rear exhaust section is manufactured in 304 grade stainless and is finished with mirror polished exhaust tips. The bumper insert and exhaust package totally changes the look of the rear of car. UPGRADE EXHAUST TIP - €199 * This will fit both the M-sport and Se models * this normally requires a backbox delete also. On the BMW 3 SERIES E90 / E92 diesel models we can make a larger bore exhaust system , remove the cat and the DPF unit , all of these will help make the exhaust more free flowing which in turn increases the power output of the car. If you increase the exhaust and remove the cat / DPF the power gains can be very dramatic after the car has been properly mapped. Our Price for a professional DPF / Cat removal pipe manufactured and fitted to your E90 E92 320d is about € 499. This job takes 1 day to complete. Left is a picture showing a BMW DPF unit on the left and a replacement pipe with a new flexi on the right side. For further information or quotations on performance exhaust upgrades you can email - Exhaustworxdub@gmail.com or visit www.exhaustworxdublin.com . As pointed out above in the exhaust upgrades section there are two main models that the BMW 3 series E90 / E92 comes in , the M-sport and the SE style. We offer upgrade replica M-sport body parts which totally change the look of the SE model.